The market may be full of these hi-end remote controlled toy cars, but for a hobbyists making one at home can be entirely a different experience. The article below explains how to configure a simple remote controlled toy car using a ready made 4-relay remote control module. 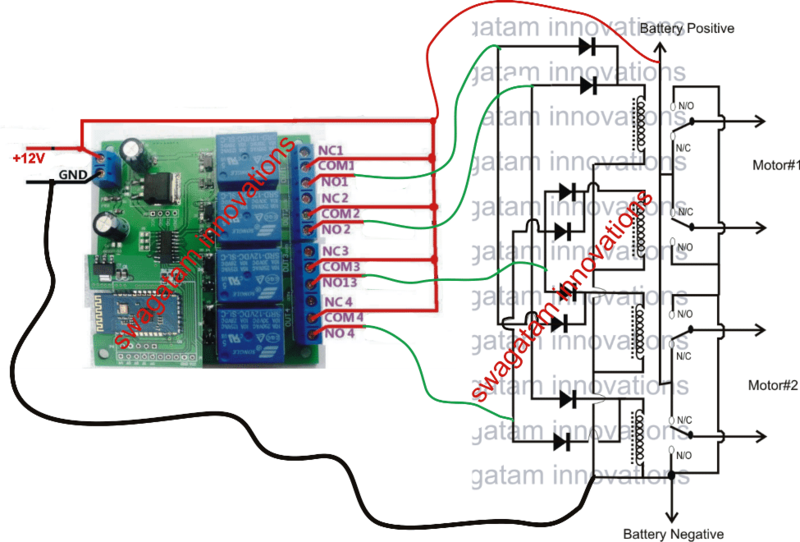 If you refer one of the previous articles you will find some data regarding buying of ready made, ready to use remote control modules or devices, which just requires to be wired as per the data and you are able to control any electrical device within a range of 100 meters with a press of a button over the remote handset. Here we are using one of these ready made remote control modules for implementing the remote car operations. In this article only the circuit and the wiring part has been discussed, making the car body and fitting of the motors and the wheels will be entirely left on the user, the user may take the help of a carpenter or some fabricator for designing the vehicle body. The remote control module which is being discussed here uses four discrete relays, which can be toggled discretely through the 4 individual switches over the remote handset. The model car is provided with four wheels, two at the front and two at the rear as usual vehicles have. The remote control unit may be procured ready-made, the one discussed here will be just perfect for the present application. A couple of DC motors. 12V Battery, 4 AH SMF, or as per the motor rating. A general purpose PC boared. Once the above things are procured, the motors may be suitably fabricated over a selected piece of metal or wooden base, such that two motrs constitute the two front wheels. Two additional dummy wheel may be fabricated for supporting the front motor wheels. After this, the PCB may be populated and wired up with the relays and the diodes with the help of the given figure, this concludes the relay box assembly. Next, the four relay outputs from the remote control in-built relays should be connected to the diodes of the above relay box circuit. The antenna from the remote should be sufficiently terminated using a foot long flexible wire so that the module becomes responsive even from longer distances. The operation will need battery power, so needless to say a suitable battery will also be required to be placed and integrated with the discussed circuits inside the toy car. Done!. Now you may test the unit by pressing the remote handset buttons. As per the integration of the relay serial numbers to the diodes of the relay box, pressing of the buttons A,B,C, and D over the remote handset would produce results in some specific orders, such as: forward, reverse, right and left movements with the car. The entire PCB along with the remote control module may be suitably enclosed over the base of the model car such that the system gives an appearance of a well groomed homemade remote controlled car. 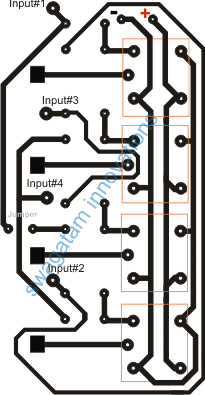 sir i need a circuit related to h bridge which have pwm pin and also feasable for 12 to 24 voltages and upto 10 amp current .i need it for robo war .will it be possible? that can never happen unless something is wrongly connected. Sir, anyway I tested with bc548 to trigger a relay. That relay should switch dc motor. But the problem is when I press ir remote the state of 4017 o/p doesnt changes, it works fine when the relay driver stage is removed. I followed the exact ckt available in net. i need a toy car inplements. i want to make a toy car with remote control but how do i go about it. hi can i have a clew of a remote car. please sir how i make a toy car with a remote control,please list the required implement for me. Sir how to turn this rc car left or right . what mechanism to use w.r.t relay connections to move left and right movements of tyres ?? Jayesh, the left/right function are executed using the assigned keys in the remote handset…the "left" button actuates the relay#4 while the right button actuates the relay#3….. the action stops one of the motors momentarily which in turns causes the car to take either left or the right turn. 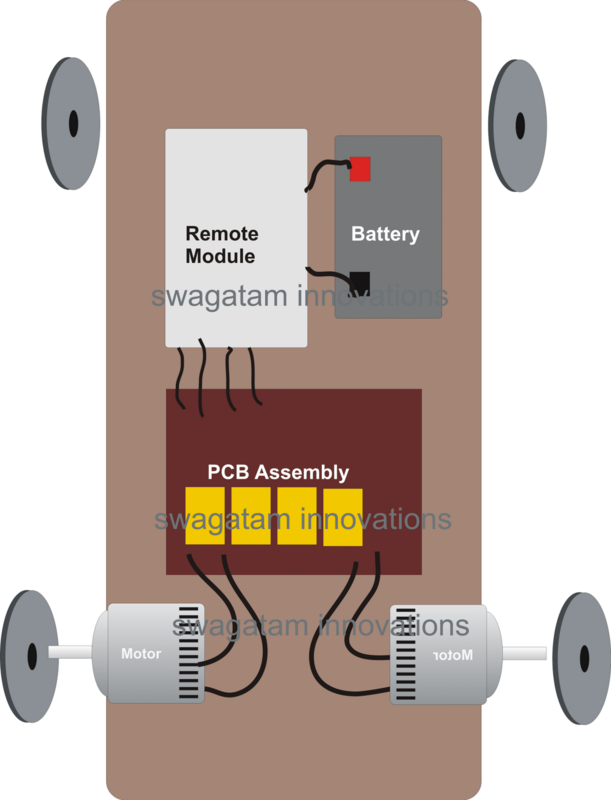 Hello Swagatam i m having remote control car n i want to make its remote so how i can make it.. If your Rx incorporates relays, listen whether it clicks or not for both the modes…or connect two LEDs across the motor with opposite polarity and check if the LEDs light up alternately in the forward backward modes…. each of the LEds must have individual 1k resistors in series…. Where can I get these simple circuit kit. I want to teach my 8th standard son. Boss plz give me a circuit wich can on/off relay by geting the alarm sound than start forever relay on. Boss can u plz give me a circuit which on/off relay by getting sound of alarm . I'll try to produce it soon in my blog! or what this helical part is a relay ? yes, those are the relay coils. 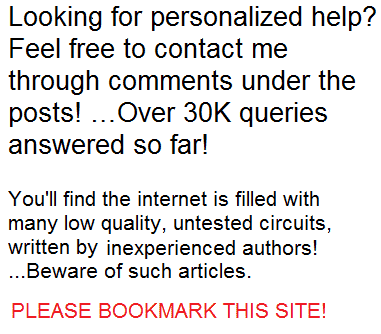 Hi, I have explained the design in the above article, you can try it out. can you provide us wireless webcam circuit? I already have Logiteck 720 pixels 500ma webcam i want a circuit so i can attach it to my RC car. 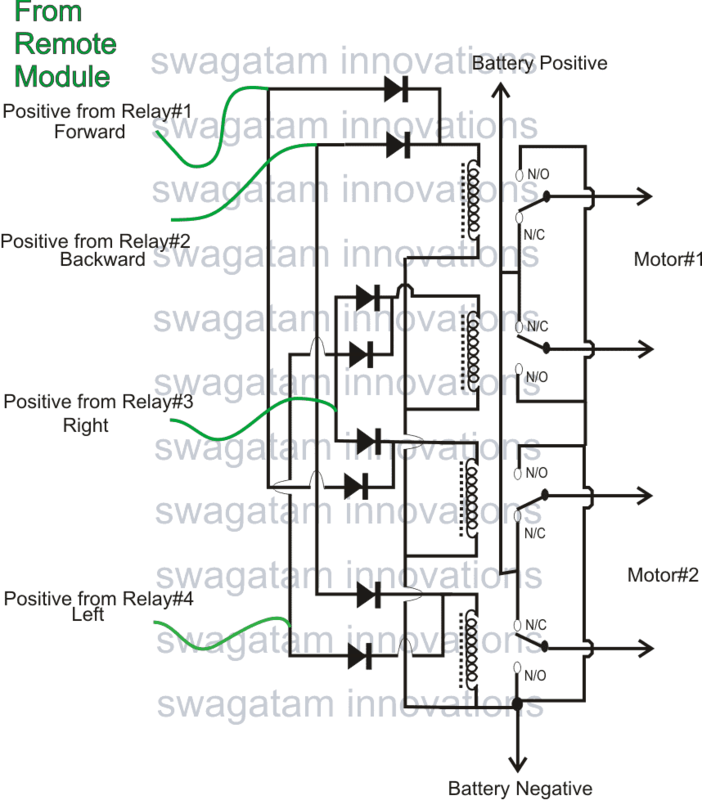 the relays you are talking about in this module can make car very heavy which can make car move slow can you recomend any light weighted transistors to use. can you provide us any circuit for wireless webacam so we can make a spy car. relays are actually very light, so no problem, yes webcam can be added by installing ready made wireless cameras in the car. can i use any remote,which mean's my old remote control cars remote? if it has 4 relay outputs, then yes you can use it with the above circuit.